There currently exists opportunities for local and national businesses in and around Bingham to gain valuable exposure through their association with the largest voluntarily run club or association in Bingham. These opportunities include sponsorship of, and advertising to, in excess of 3000 people on a weekly basis, and at the same time support the local community of Bingham. Exposure to these people can take various forms depending on your budget and desired levels of reach. Who are Bingham Town Youth & Senior Football Club? 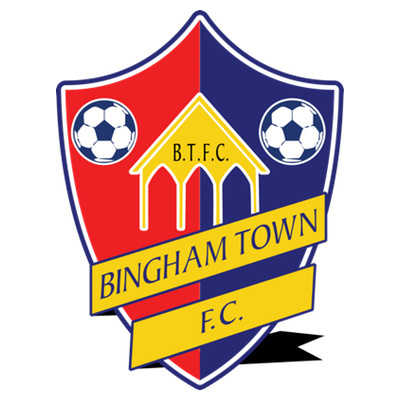 Bingham Town Youth Football Club was founded in 1993 with just 6 teams. We have steadily expanded since, and currently boast an amazing 29 teams in total, including 25 youth teams from Under 6 to Under 18’s, with 2 Mens, 1 Ladies and 1 Disability team representing Bingham around the county. This constitutes a total number of 480 Registered players, and an additional 80 coaches plus members of the Club with Roles of Special Responsibilities such as Football Development Officers, Child Welfare Officers and First Aid Officers. BTYFC are an FA Community Charter Standard Club, which means we have worked hard to satisfy the criteria set down by the Football Association and demonstrated to all members, parents and the public that we are a well organised, safe Club offering opportunities for all. BTYFC was confirmed as a Charter Standard Community level Club for the second year in January 2012, keeping it within the top 10 Clubs in the county. The Club’s vision is to become one of the top grassroots football clubs in the country and we are taking all the necessary steps in terms of football development and child welfare to achieve this. At our heart is the desire to provide a safe and enjoyable environment to nurture and develop the children of the community of Bingham, to provide qualified coaching and become a successful and community spirited Club. The Club is already being recognised by the FA inside and outside the county for its progressive style. Bingham Town YFC are based at the recently build Buttfield Sports Club, a home we share with the other members of the community based Bingham Town Sports Club. These includes Bingham Cricket Club and Bingham Town Vets FC. It is an excellent facility, part funded by Sports England & the Football Foundation, and as our home, provides many opportunities for local businesses to directly reach the numerous users of these excellent facilities. Mark Sampey – Sponsorship & Advertising Co-ordinator on 07891 901461.